This is a guest post by Dr. Aref Najafi of the Lake Urmia Conservation Institute, and contributor to the recent UNEP report “The Drying of Iran’s Lake Urmia and its Environmental Consequences.” This post provides a more in-depth look at the political context of the Iranian government’s neglect of lake Urmia, building on our recent article on the climate, water and security dimensions of the problem. After the 1979 revolution in Iran, the country became a headline for breaking news for some 30 years. Every one of us, one time or another, has seen headlines about hostage taking, human right abuses, stoning, crimes against humanity and ethnic discrimination with respect to Iran. But as the Iranian government continuously gains experience in managing the information stream, one can notice how recent headlines about Iran have changed. In spite of the fact that Iran has the second highest rate of deaths via the death penalty after China, the news about Iranian political prisoners do not gain airtime anymore, or become invisible compared to news about Iranian nuclear ambitions. Maybe that is one of the reasons that the Iranian government does not give up on chronic negotiations. The government is taking advantage of the situation, utilizing the nuclear headlines or aggressive positions against neighbouring countries (another successful strategy) to control headlines in its desired space. In this context, one news item that has remained buried is the drying of Iran’s salt lake Urmia, a crisis which threatens the lives of 6 million people, and affects the lives of 76 million people in the area, based on a recent United Nations Environmental Program (UNEP) report. Lake Urmia is situated between the East Azerbaijan and West Azerbaijan provinces of Iran. It is the largest lake in the Middle East and the third largest salt lake in the world. Registered as a Biosphere Reserve by UNESCO and listed as a wetland of international importance under the 1971 Ramsar Convention, Lake Urmia accommodates one of the world’s richest biodiversity. More than 210 species of birds, such as flamingos, pelicans, spoonbills, and gulls, as well as many species of reptiles, amphibians and mammals, such as yellow deer inhabit the lake and the surrounding riparian area. During the last decade, however, Lake Urmia has shrunk significantly and its depth has fallen by almost seven meters. Experts believe that surface flow diversions, groundwater extraction, and the lack of efficient water management are the main reasons. Lake Urmia holds an estimated 8 billion cubic metric tons of salt. According to experts, if the lake completely dries up, which can happen in some 50 years from now, a vast amount of salt will be released into the region resulting in an ecological, agricultural, and social catastrophe not only in Azerbaijani cities of Iran, but also in neighboring countries such as Turkey, Iraq and Azerbaijan (see the UNEP report). It will force many people to abandon their villages and towns around the lake and a vast majority of the flora and fauna will be lost permanently. UNEP, in their GEAS bulletin (Global Environmental Alert Services) dated February 2012, declared the status of the lake as “alarming,” which requires attention and immediate actions to avoid environmental catastrophe . For example, in a very recent interview (September 2011) of the World’s Radio News Magazine with Dr. Esmail Kahrom, professor of environmental sciences at the University of Tehran, Dr. Kahrom warned that disappearance of the Lake Urmia will result in severe salt storms. Dr. Kahrom pointed out that the salt storms have already started since more than half of the lake’s surface is now gone and a thick layer of salt has appeared. “It [the salt storm] can travel up to about 500 kilometers” he says . In the same interview , Dr. Kahrom pointed out that: “It has been estimated that six to eight cities will be totally destroyed, covered by layers and layers of salt. That’s four to fourteen million people that have to be displaced to avoid the storm of salt within that region”. Most of the population will be forced to flee their homeland and will have no choice but to emigrate to other regions of Iran. At least 10 million people will be directly impacted and will need to move from the vicinity of the lake (see the report by StrategicOutlook.org called “Iran’s Environmental Ticking Bomb”,  ). The situation also has major demographics/ethnic roots, implications and impact (Iran’s demographic and ethnicity map as of 2004 is shown in Figure 1). The neighboring areas of the lake are inhabited by Azerbaijani Turks, which account for more than third of Iran’s population (about 30 million people). The Iranian government has a solid record of abusing minority rights. For example, Azerbaijani Turks, as well as Arabs, Kurds, Balouch, Qashqayi Turks, and other ethnic minorities, do not have the right to read and write in their own language. In recent history this was one of the major sources of instability in Iran. 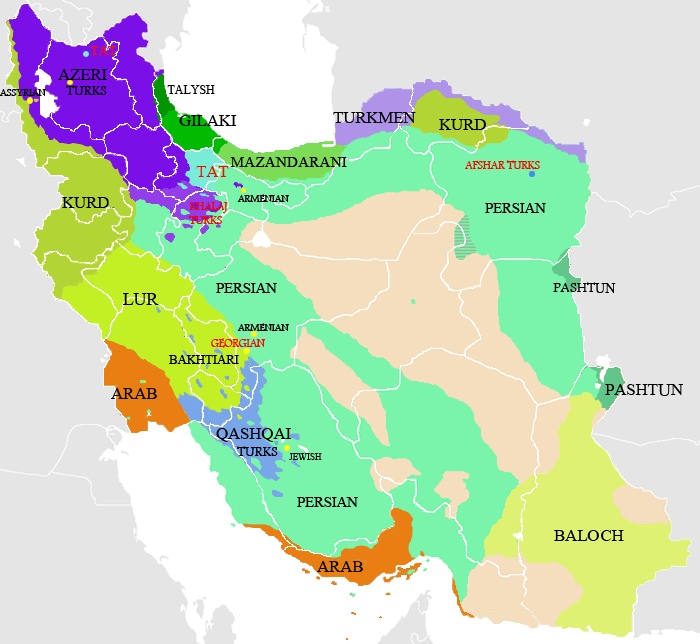 The Iranian government had used various pressure tactics to control and manage the situation, in spite of several cases of ethnic groups uprisings . For example, during 1946 to 1947, the Azerbaijani Turks declared their independence and established the “Azerbaijan People’s Government.” During that same period, the Kurds declared their autonomy and established their government as well. Those autonomous governments were in power for one year only, and collapsed after an invasion by the Iranian army. Even though those governments collapsed, the fear of similar movements has never faded from the Iranian government’s agenda. Certain authors, and many Azerbaijani Turks in Iran, believe the Iranian government is intentionally ignoring the drying of Lake Urmia to achieve its geopolitical goals. Under this hypothesis, the government is using the deliberate neglect of Lake Urmia to facilitate the migration, displacement and ethnic cleansing of Azerbaijani Turks in Iran. Such tactics have been utilized in many places across the globe in the past, e.g., in Czechoslovakia . There are many points of evidence which support this hypothesis. For example, in August 2011, the Iranian parliament failed to adopt measures to stem the gradual drying and disappearance of the lake. The parliament also rejected an emergency bill to divert water from the Aras River to Lake Urmia. It seems that the Iranian government has plans to displace Azerbaijani Turks and Kurds from their historic location, and is using the drying of lake Urmia as a proxy. This is a humanitarian and environmental crisis that the world cannot ignore. The World Radio News Magazine, “Iran’s Disappearing Lake Orumiyeh Threatens Salt Storm,” Phone interview, Iran’s Disappearing Lake Orumiyeh Threatens Salt Storm (http://www.theworld.org/2011/09/the-consequences-of-irans-lake-orumiyeh-drying-up/), MP3 file: http://media.blubrry.com/world/p/www.podtrac.com/pts/redirect.mp3/media.theworld.org/audio/090520118.mp3, September 11, 2011. K. Crane, R. Lal, and J. Martini, Iran’s political, demographic, and economic vulnerabilities: Rand Corporation, 2008. N. Boms and S. Arya, “Iran’s Environmental Ticking Bomb,” http://www.strategicoutlook.org/2011/09/iran%E2%80%99s-environmental-ticking-bomb/, Sept. 2011. By Francesco Femia & Caitlin Werrell in climate and security on May 18, 2012 .